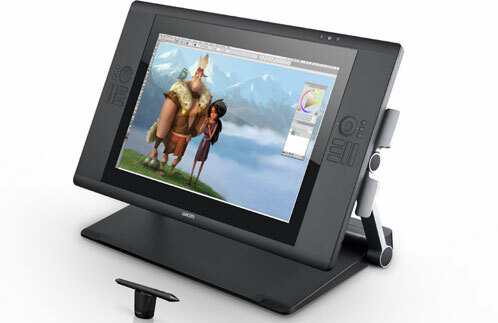 Graphic tablets in the field of design can be a very helpful tool to improve work production. If you are a illustrator, graphic designer, artist, 3D artist or web designer, your work can benefit from the use of graphic tablets. Someone asked me the other day what is a good tablet to start with? This depends on your budget and need. Wacom is the leader in the graphics tablet market, when you use their products, you can instantly tell the difference in quality. Of course, with this quality you will pay a premium for the products and there are always off brands and used ones you can find on Ebay. Starting out Ebay and Craigslist can be your best friend. If you prefer new, the cheapest entry level Wacom you will find is the Bamboo. These are entry level and around $100 but tend to be on the small side. The Intous product line is the next step up and a lot of professionals use this line, prices can range from $200 – $1000 for these tablets. With these lines, you look at your monitor while your hand stays on the pad, it will take some practice to get use too. The line if you have the money that feels the most natural is the Cintiq line. These tablets have monitors built in them, of course these are the most expensive and can run from $1000 – $3000. But they are top of the line and to most professionals feel these are the best there is. Either way you go there is always a learning curve. There are other options out there, such as an iPad, but to draw with a iPad stylus is like drawing with a dull crayon. The Windows based tablets do offer a more fine point stylus for drawing as well.